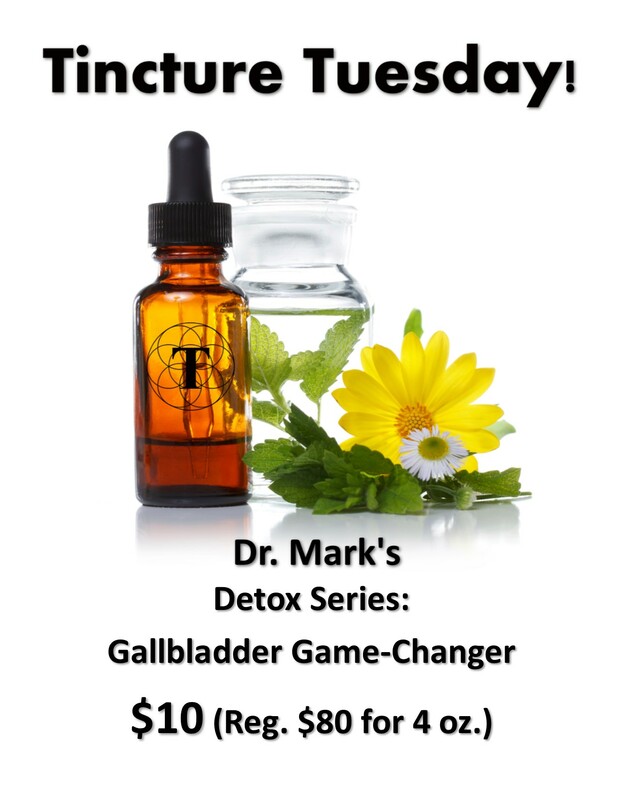 Every Tuesday, Dr. Mark Carney, RND, LAc (NPR, Fox News) formulates a special tincture at a reduced rate for our Thriveology Commu nity! Your gallbladder is part of the human biliary system, the system involved with the very important tasks of producing, transporting, and storing bile. What’s bile you ask? It’s the substance produced by the liver to break up and digest fatty foods. The bile also plays a critical role in the body’s detoxification, as many toxins are purged via bile. Some problems associated with the gallbladder are gallstones, gallbladder attack, and gallbladder disease. Factors that contribute to these conditions include obesity, high-fat or high-cholesterol diets, and taking medications with estrogen. Women and those over 60 are at a particularly high risk. The most common symptom of a compromised gallbladder is pain in the mid-to upper-right section of your abdomen. The pain can sometimes radiate to the back or the shoulder. People with gallbladder problems may also experience nausea, vomiting, fever, chills, chronic diarrhea, jaundice, and unusual stools or urine. Poor digestion is also a common symptom of gallbladder issues. This tincture supports gallbladder function by improving bile production, bile composition, bile flow, and preventing gallstones. This formula also soothes the GI system, providing anti-spasmodic activity as well as pain relief. What’s Inside: Chelidonium majus (Greater Celandine) – Also known as Wart Weed, Greater Celandine is a perennial plant with the ability to self-pollinate. This herb has been used for several centuries to treat health problems ranging from skin complaints to gallbladder disorders. Greater Celandine soothes indigestion and nausea and expels gallstones while also preventing their formation. Peumus boldus (Boldo) – Boldo works to support the gallbladder in multiple ways. For example, Boldo contains the alkaloid boldine, which reduces inflammation of the gallbladder while also providing pain relief. Boldo also relaxes the “smooth muscles” including the gallbladder, cystic ducts, and common bile ducts. Finally, Boldo aids in expelling gallstones. Andrographis paniculata (India Echinacea) – India Echinacea has a long historical record of medicinal use and has been used for centuries in traditional Chinese medicine as a treatment for diarrhea, dysentery, cholera, and inflammation. It’s effective in the treatment of gallbladder conditions because the active ingredient andrographolide increases the levels of bile acids and bile salts and the overall flow of bile. Silybum marianum (Milk Thistle) – Milk Thistle has been used medicinally for over 2,000 years, most commonly to treat liver and gallbladder disorders. Milk Thistle works by preventing the absorption of toxins, preventing oxidative damage to the liver and gallbladder, repairing damaged cells, and maintaining healthy bile production. Fumaria officinalis (Fumitory) – Also called “Earth Smoke”, Fumitory was used by the Romans and in Ayurvedic Medicine in India. Fumitory heals inflammation of the skin and other organs, and also contains antioxidants. Fumitory treats irritations of the GI and also prevents the formation of gallstones. Lavendula angustifolia (Lavender) – Cultivated extensively for perfume and potpourri, Lavender is widely used for all kind of muscular aches and pains, including the smooth muscles like the gallbladder. Lavender increases bile flow output and flow into the intestines. What You Can Expect: This tincture can improve digestion and soothe nausea, diarrhea, and inflammation. Dosage: The effect of tinctures vary, because each of us are unique. The average recommendation is 30 drops 3x/day. Shake well before dispensing each dose. The liquid can be taken straight, or mixed into water or another beverage. For fastest absorption, hold the liquid under your tongue for ten seconds, then swallow. To pick up your $10 tincture, come into Thriveology’s office7120 East Hampden Ave. , Suite B Denver, CO 80224 Or call (303)636-0000.